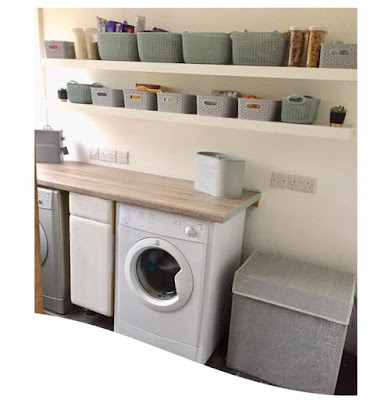 Mum of Five Staying Sane: A day out in London for 'me time'. 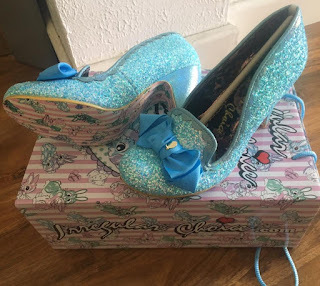 My first Irregular Choice purchase & some Selfridges exclusive Krispy Kremes too. A day out in London for 'me time'. My first Irregular Choice purchase & some Selfridges exclusive Krispy Kremes too. A few weeks ago myself and the bestie hit London for a day out and some time out from the kiddies. Leaving the Things in the hubby's quite capable hands I jumped aboard a, later than expected, train and headed to meet the bestie in London. Every once in a while we make sure we book in a Sunday date to go out together as we both need it/deserve it/need time to get away and possibly have a rant at each other over lunch if need be too! Having 9 children between us there is usually lots of talk about them, some good and some not so but mostly good! However I do try and keep kid talk to a minimum although it doesn't always work. Our most recent trip into London was because I was on a mission. I was looking to make my first ever purchase of Irregular Choice shoes so we planned to hit Carnaby Street first. However by the time we got there it was lunch time already and we both needed to eat so my purchase had to wait a bit longer whilst we searched out somewhere to get some yummy food and we weren't disappointed. 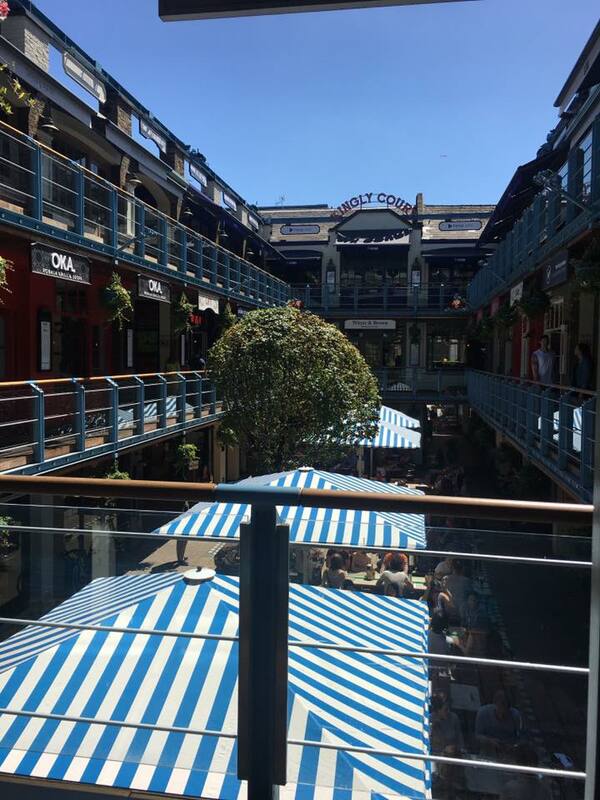 We searched out Kingly Court, somewhere the bestie had eaten previously, and there were so many restaurants to choose from. After a quick look around at various different menus we opted for a Jamaican restaurant called The Rum Kitchen. The food was lovely and the view out from the restaurant was gorgeous, it was a particularly lovely July day too. The view from The Rum Kitchen restaurant in Kingly Court. It was a lovely warm day and we sat looking out over the food court. After our lunch of halloumi and mushroom burger, seasoned fries and sweetcorn fritters we were fully fuelled and ready for shoe shopping. The Irregular Choice shop wasn't far from the restaurant and we were soon in shoe heaven with sooooo many gorgeous shoes to choose from. I was looking for something for an upcoming wedding but that I would wear more than just the once! We had a good look around before deciding and it wasn't easy. The shop is bright, colourful and stocked full of shoes in lots of different styles and patterns. After a couple of circuits of the shop and picking up various different shoes I chose the gorgeous Kanjanka style in blue. I could have left the shop with a few more pairs but I behaved. My first Irregular Choice purchase. Kanjanka style in blue. After our fun in shoe heaven we decided to head to Selfridges as we knew there were some scrummy looking Selfridges exclusive Krispy Kreme doughnuts that needed our attention! I do love taking a look around Selfridges food hall. 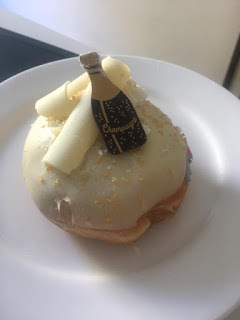 The hubby wants to visit the Oyster and Champagne bar there but I was quite happy with all of the cake, chocolates and doughnuts on offer. I had a taster of some white chocolate with pistachio and sea salt with gold on the top, it was extremely scrummy and I should have treated myself (even after the shoe purchase!) but I didn't. Selfridges exclusive Krispy Kreme doughnuts. On the left is the Champagne Touch and on the right is the Magic Unicorn. The Krispy Kreme counter awaited and I purchased half a dozen of their exclusive to Selfridges doughnuts. 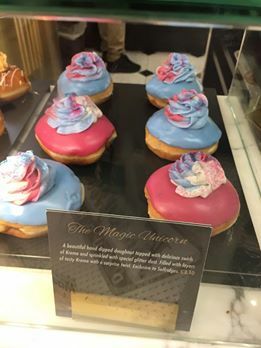 These looked special, I love a Krispy Kreme doughnut anyway but these were even better. With magic unicorn, Champagne touch and Red Berry Drizzle amongst others to choose from I was in doughnut heaven. Doughnuts bought we decided to head back towards home. With cake and shoes in hand we had had a lovely day and definitely one that needs repeating. 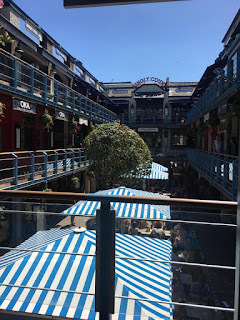 We could try a different restaurant in Kingly Court, buy more shoes, more doughnuts and maybe fit in a trip to the theatre too. 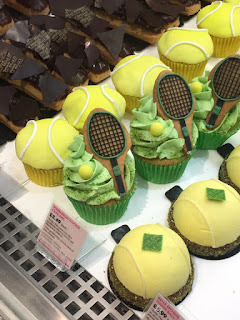 Some gorgeous Wimbledon themed cakes I spotted in Selfridges food hall. I did purchase the tennis racket cupcake. Here's to more Sundays with the bestie wherever they may take us!